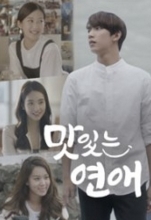 In the plot, the main male character, Sung-Joon, is a very likeable, handsome chef. He seems to be enjoying a perfect life, but is actually struggling in his relationships. K-pop idol Gong Chan put in a lot of effort to successfully portray this character - he was tutored by an actual chef who had participated in the TV competition program Master Chef Korea Season 2 and devoted long hours at home to practice the techniques he had learned. Moon Ga-Young plays Su-Jin, an employee working at the restaurant JUNE. She works a part-time job to save money for tuition, and falls for Sung-Joon as the plot progresses. Kim Yoo-Mi plays Yoo-Na, the daughter of owner of a resort in Jeju Island. Kim Hee-Jung appears as Jun-Hee, the editor of a Korean food magazine K-FOOD. Jun-Hee is an ex-lover of Sung-Joon, who meets him again in Jeju Island, her hometown, as she pays a visit there for an interview. Delicious Love launched on the 5th, released its second story on the 7th, and concluded on the 9th. It appeared on Naver TVcast, YouTube, Youkou, and Weibo.